"The Barrelhaven. From whence comes this storybook set?" 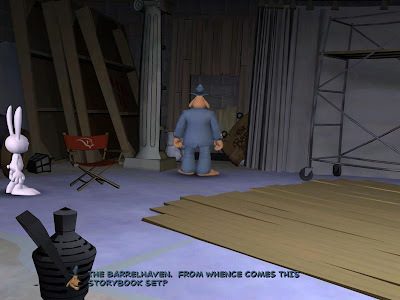 The Barrelhaven set is behind the scenes at the WARP studios. Barrelhaven is the tavern in the Bone books, and is seen in Telltale's Bone: The Great Cow Race. David Nowlin was the voice of Fone Bone, as well as the voice of Sam. In the blooper reel of Season One, he uses Fone Bone's voice when he says the Barrelhaven line.